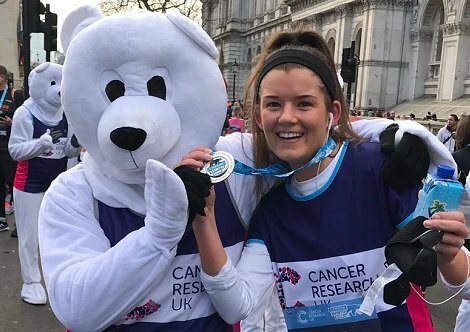 Congratulations to Jade Sullivan, Positive’s Sales and Marketing Executive, who completed her first 10k challenge on Sunday 3rd February at the Cancer Research UK London Winter Run. Jade has raised a whopping £615.00 for Cancer Research UK so far, 246% over her original fundraising target. The Cancer Research UK London Winter Run is a 10k race through the heart of the city, passing world famous landmarks and instantly recognisable areas that have been taken over by winter creatures. Since the first event in 2015 over 65,000 people have taken part, raising over £2,000,000 for Cancer Research UK and other good causes. This year’s race started in Trafalgar Square and finished on Whitehall by Downing Street. Jade completed her run in just 53 minutes and finished in the top 5,000 runners, out of 23,000 competitors. If you would like to sponsor Jade, you can do so here.